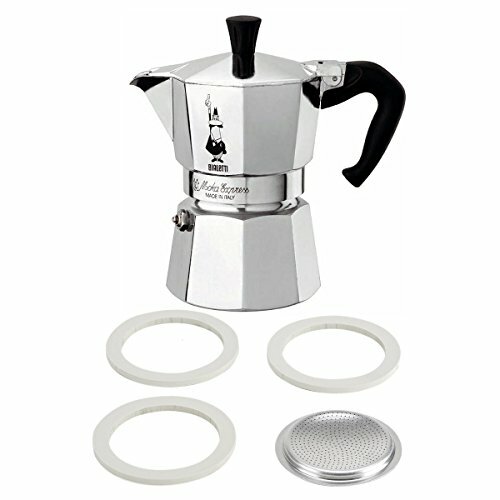 The Moka Express is the original stove-top espresso maker from Bialetti, created in 1933. Most Italian natives agree that stove-top preparation makes the most delicious espresso. The cast aluminum pot features the distinctive eight-sided shape that diffuses heat perfectly to enhance the aroma of your coffee. To use, simply fill the lower chamber with water, fill the filter with your favorite espresso grounds, and boil on the stove-top. As an added bonus, this set includes three white rubber replacement gaskets and one filter plate.